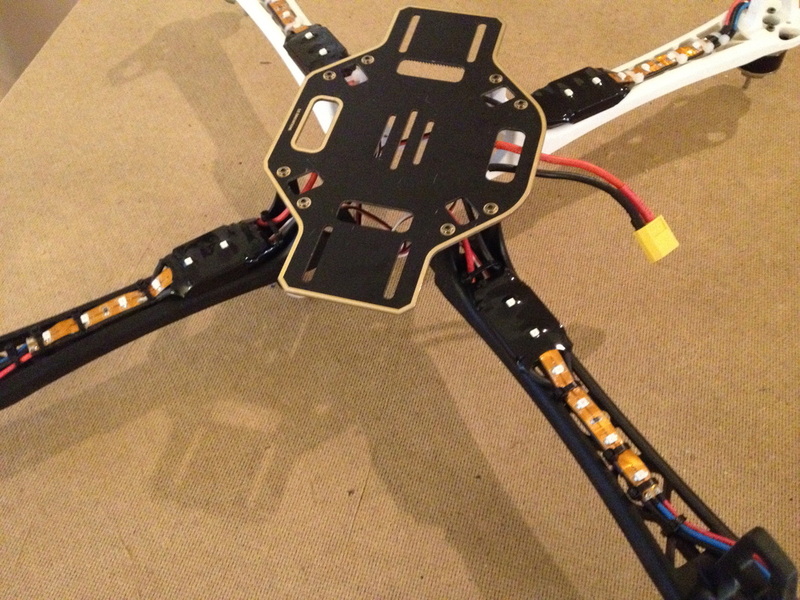 For my power system in this quadcopter I decided to go with 1200KV Turnigy Motors, 25A Red Brick ESC's from HobbyKing and 9x5x3 Propellors from GWS Props. 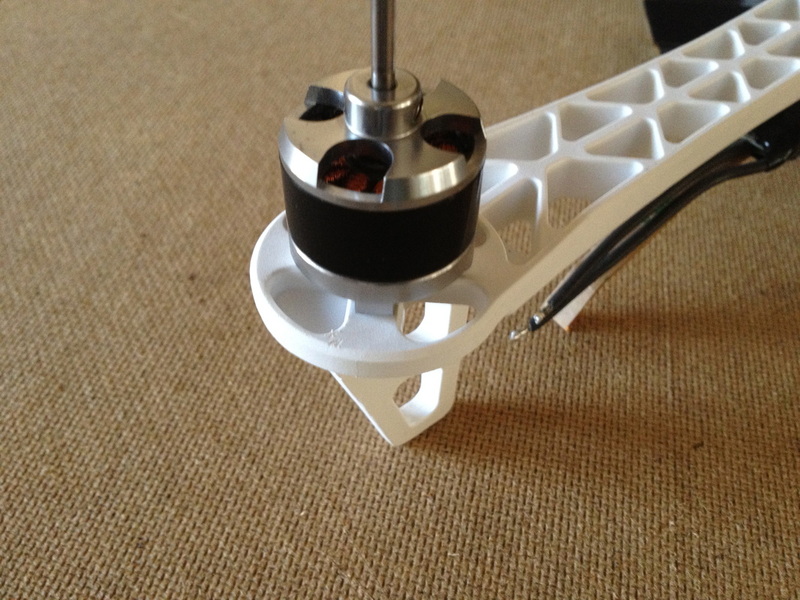 The motors have a power rating of 150 watts and came with a full accessory pack which included mounting hardware as well as a prop adapter. 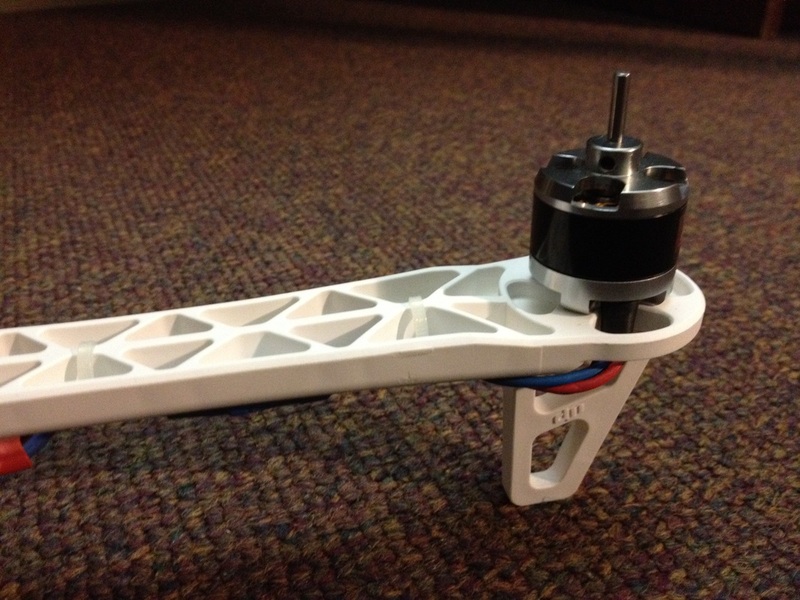 Using these motors with the 9x5x3 propellors generates about 900g-1000g of thrust. This setup provides plenty of power, allowing me to hover at about 35% throttle and drawing less than 25 amps each. 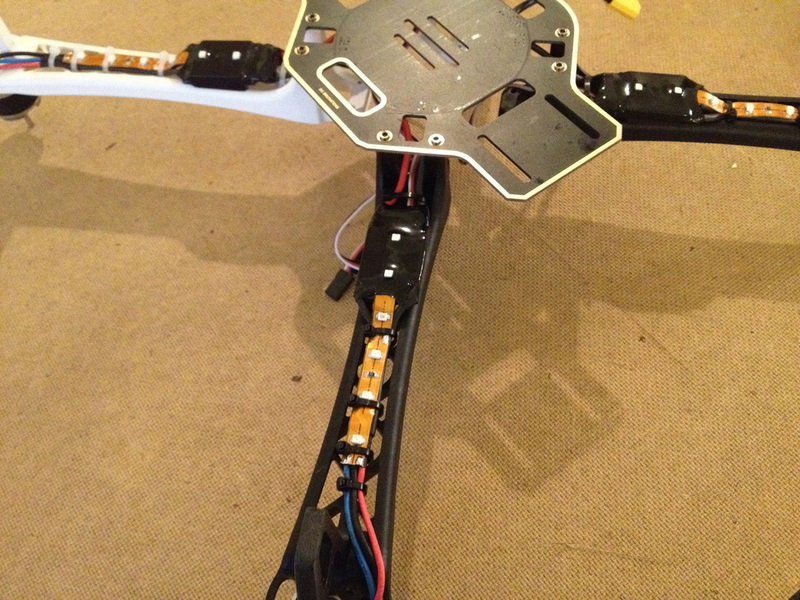 I went through two different versions for connecting my motors and ESC's; version 2 is the latest version and is what I currently have on my quadcopter. After I had created my lighting system in the previous step, the first thing I wanted to revise from Version 1 was the ESC firmware. 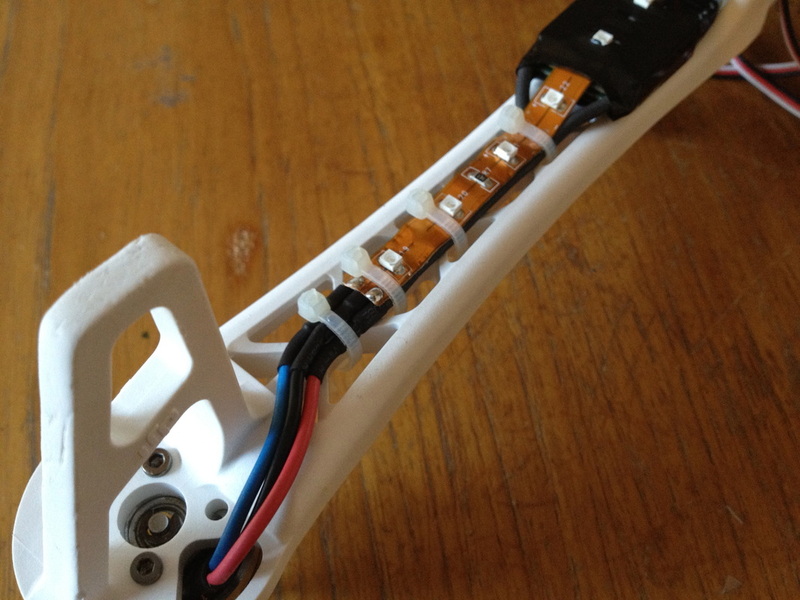 The stock firmware that comes with these inexpensive ESC's is poorly made in that it doesn't refresh the motor speed at a very high rate - which is something that is necessary for a multirotor that flies well. 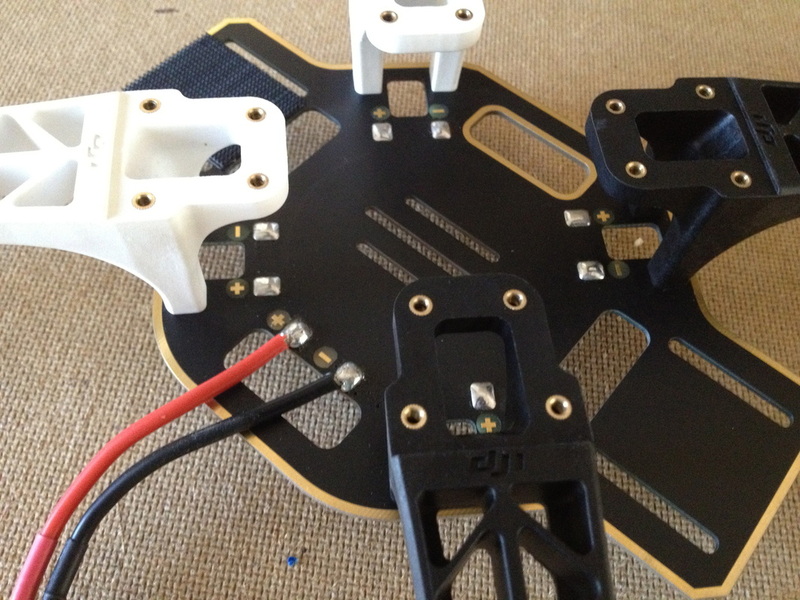 For more information on how I flashed these ESC's, please visit the tutorial on ESC Flashing. 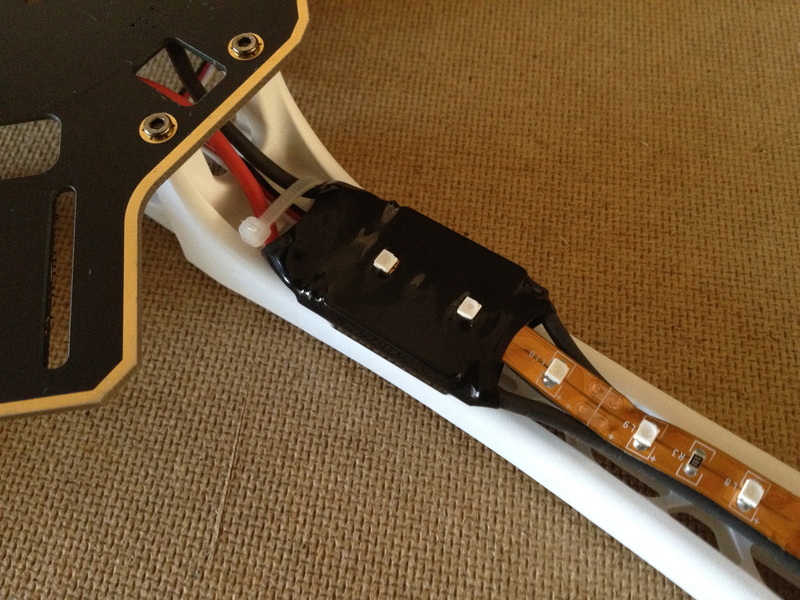 After I had flashed the ESC's, I decided to mount the motors the same way - with two M3 bolts holding it in place and the wires fed through the side hole of the arm. 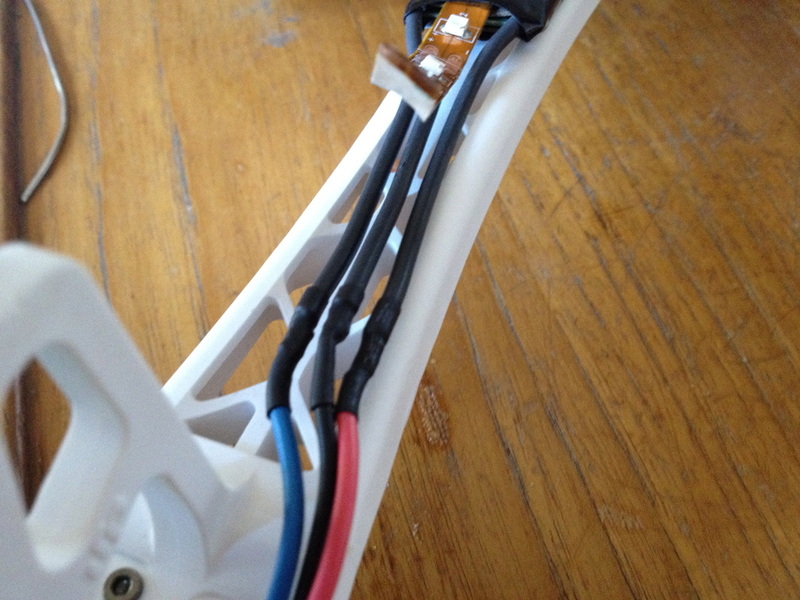 Once the motors had been mounted, I replaced the stock blue wire coming out of the ESC with black wire. I also got rid of the old bullet connectors between the motor and ESC and replaced them with direct solder connections. I covered those connections with small black heat shrink. 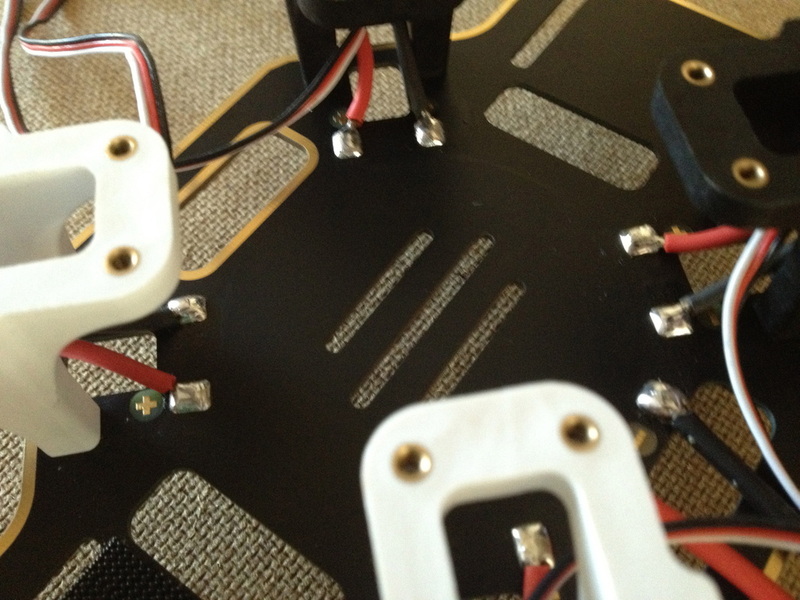 After I had connected the motor wires to all four ESC's I moved on to connecting the power cables to the power distribution board. Feeding each of the ESC power wires under each arm, I soldered the positive and negative wires to their respective terminals on the distribution board. 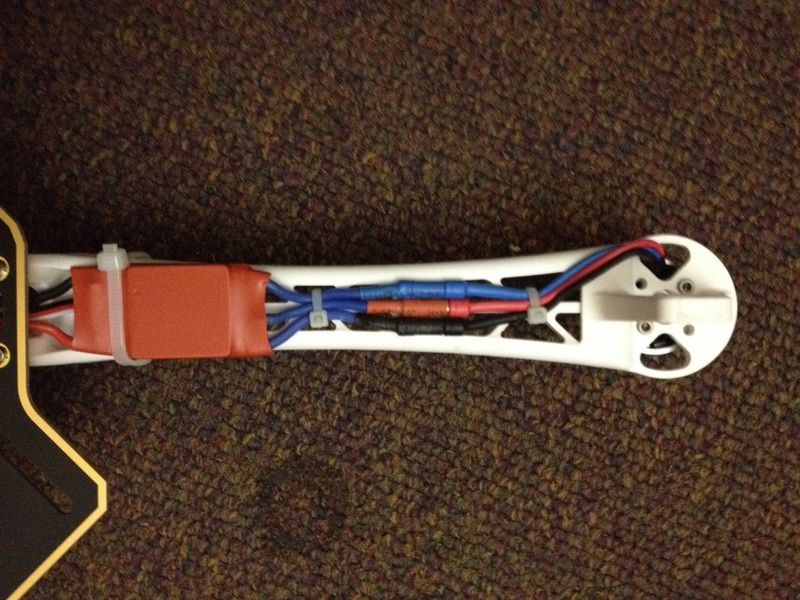 Then, using both black and white zip ties, I secured the ESC's to the underside of the arms in multiple locations. 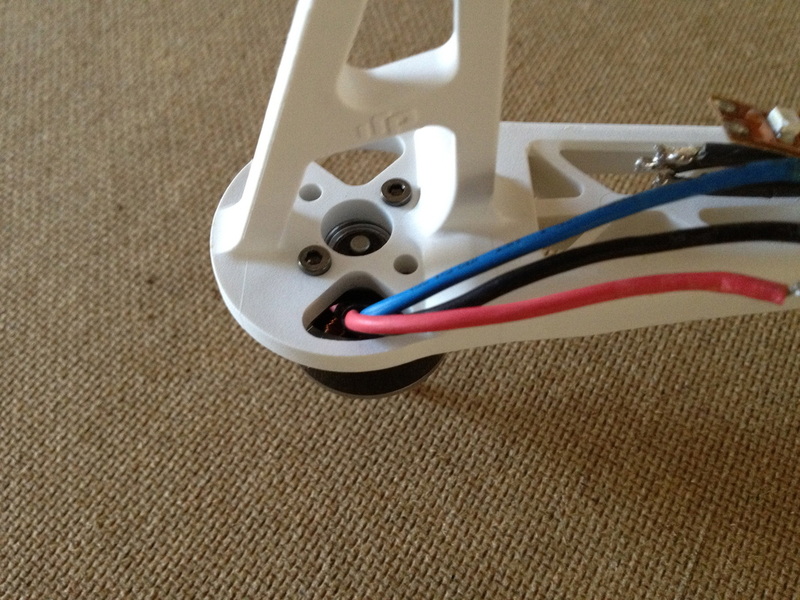 The two pictures below show the initial setup I had on my quad the first time I flew it. 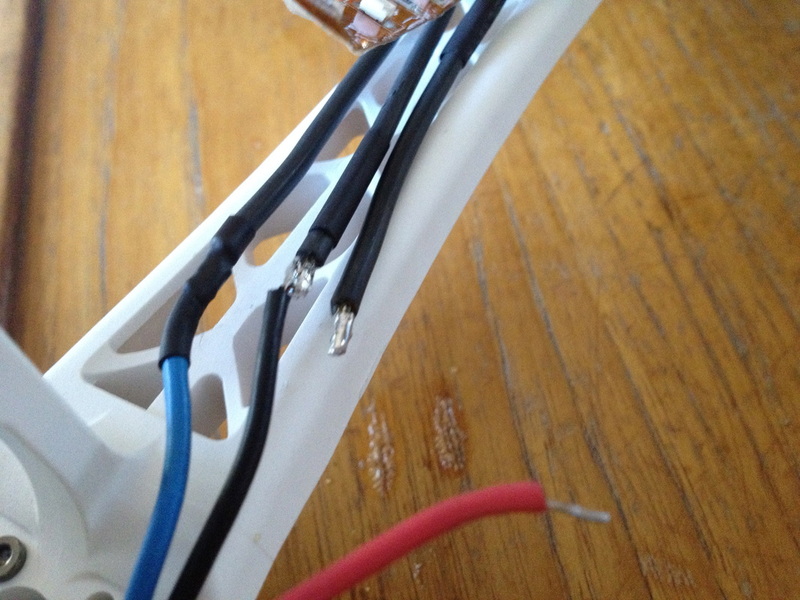 I zip tied the Red Brick ESC's to the frame and used bullet connectors to join the ESC wires to the motor wires. This was a very rough setup and although it worked well, I felt that there was still room for improvement.